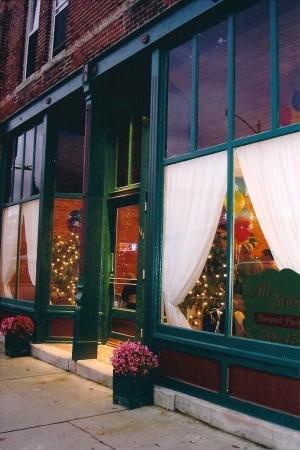 "All Moments... All Events... All Seasons"
All Seasons Banquet Facility is in downtown Albany, Indiana. The building was built in 1890 and was once a carriage shop, grocery store & bank. While preserving the historic feel of the building, the renovation made "everything old - new again". We now have two separate rooms available for your special events. Our Main Room can hold 80-100 guests and our Vault Room can hold 30-36 comfortably. Use both event rooms for those parties needing space for 100-120 guests. Our facility has a full kitchen, built in bar area and garden patio area with additional seating for 30 guests in warmer months. Our facility is also handicapped accessible. Set-up and Tear-down services are provided as part of your facility rental. Call today to discuss options and pricing information.